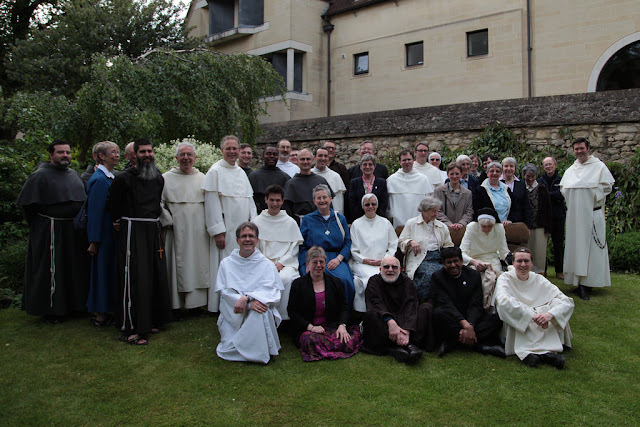 Earlier today the religious of Oxford, with parishioners, friends and colleagues, celebrated the Year of Consecrated Life by coming together for a special solemn First Vespers of the Holy Trinity, presided over by our area bishop, who is also a religious. We were quite an impressive roll call of traditions and charisms, with Assumption Sisters, Benedictines, De La Salle Brothers, Dominicans (men and women), two types of Franciscans, Holy Child Sisters, Jesuits, Oratorians, RSCJ, Salesian Sisters and Sisters of The Work; plus two Anglican All Saints Sisters, our Passionist bishop and our Vicar for Religious, a Sister of Charity of St Paul. Today is a historic day in the life of the Catholic Church in Oxford. It's the first time representatives of our many religious congregations, from a wide variety of spiritualities and traditions, have come together for the praise and glory of God in this way, led by our area bishop, who is also a religious. The catalyst was the Year of Consecrated Life, and our desire to respond publicly to Pope Francis' call to all religious to radiate the joy of our lives, given in love, and witness to God, the source of our joy. What in particular do I expect from this Year of grace for consecrated life? That the old saying will always be true: "Where there are religious, there is joy". We are called to know and show that God is able to fill our hearts to the brim with happiness; that we need not seek our happiness elsewhere; that the authentic fraternity found in our communities increases our joy; and that our total self-giving in service to the Church, to families and young people, to the elderly and the poor, brings us life-long personal fulfilment. It is God's will that we have heartfelt joy with him in our salvation... For we are his happiness, and he finds endless enjoyment in us, and we shall in him, by his grace. And the heart and source of this joy can only be love: God's amazing, unbounded love for each one of us, which can only call forth a response given in love. And so we have this wonderful, dynamic movement... joy, flowing out of love; love responding with delight... but always originating from and returning to God. We can see this too in the image on the front of your booklets, which was specially designed for these vespers by Friar Matthew Bond OFM Conv. There's a heart at its centre, and various symbols - of commitment, fidelity, sacrifice and self-gift. They can be seen as symbols of what we offer God, but fundamentally, they show what God offers us: a love, uncontained by the world, which is open handed, generous, faithful and true... even unto death. Here again we have this double movement of love, this dance of call and response, this invitation - and it's always invitation - which for me and many others here led us into consecrated life. 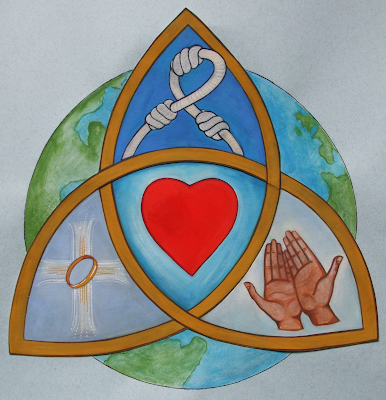 And it's very appropriate that we reflect on all this today, as we begin our celebration of the Holy Trinity, and plunge into the depths of unbounded love and joy which are at the heart of the Trinity's very essence. I remember, years ago, someone once describing the Trinity as "fizzing" with love, and that's a lovely image for a love relationship which is alive and active. But that love relationship only really fizzes because it transcends itself, because it goes beyond itself into loving all creation with a love as powerful and abundant as the love which binds it to itself. And the God who is love and Trinity calls us to be and do likewise: to be people who fizz with the energy and strength of divine love, which impels us to go beyond ourselves taking that love wherever we can. In a few minutes we will sing the Magnificat, Mary's great hymn of joy and praise. In the Annunciation and the Visitation (which we would normally celebrate on the 31st May) we see the Trinity alive and active in the gracious call of the Father, to give life to the Son, through the power of the Holy Spirit. As we sing her hymn let us pray that Mary may help us to become like herself: that we too may be completely open to whatever God asks of us, allowing ourselves to be transformed by the Spirit so that we may carry the life of Christ within us, bringing him to a world which hungers to be filled to the brim with the joy of his love.